Fellow Homies Ian Osborne and Cash Callaway are co-pilots for their production enterprise appropriately named The Infinites Music, for the limitless creative projects they tackle. Their unique and evolving production sound encompasses hip-hop, R&B, electronic, and a hybrid of pop with a live band. Overall, their sound is beat driven with an aggressive edge. Both Ian and Cash grew up in Dallas, TX, coincidentally 3 streets away from one another. However, since they are 10 years apart in age, their destined meeting occurred later when they crossed paths through Septien Entertainment Group around 2008. Cash was the lead engineer at SEG while Ian was a developing artist, so the two began their creative relationship while Cash was producing Ian's solo music. At the same time Cash was helping produce Ian’s pop music, Ian was also a student at Musicians Institute. Ian took advantage of the resources given to him at SEG and would ask Cash to help him on school tasks related to production, or just general curious questions about production. Through their creative, technical, and pedagogical interactions, the two built a close rapport and creative relationship that eventually lead to the inception of The Infinites Music. With its start in 2016, the name of The Infinites Music originated from a conversation between Ian and Cash at a Sonic while eating burgers. The duo wanted a company name that would have an awesome symbol with it, to succinctly visualize who they were. In addition to wanting a symbol, the duo abides by the principle that everything has a narrative. So, abiding by a character driven idea in the world of graphic novels, the two imagined the bizarre, such as “Wobble Sauce and the Side Chain Assassin” (as a nod to the then prevalent dub-step culture). Eventually, they landed on The Infinites, which upon research they discovered were actually characters loosely related to the Marvel franchise, but the domain name was available, so they found a winner! 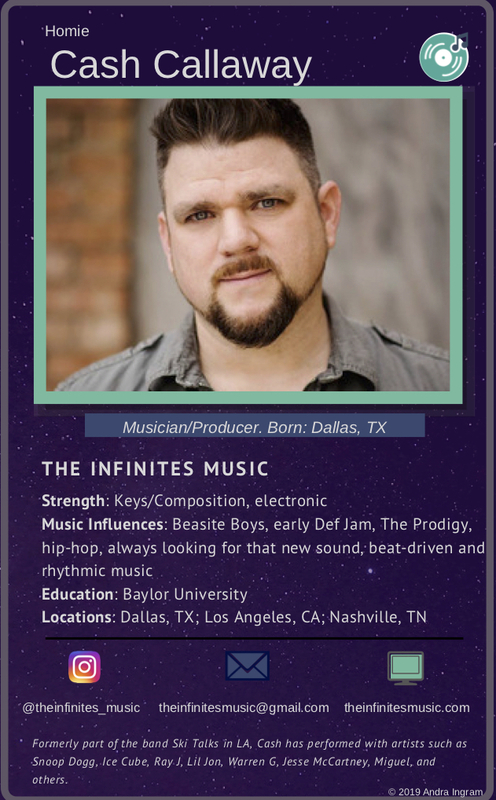 Not only does The Infinites Music name hint to awesome graphic novel characters, but it also yields to reaching beyond ordinary production tasks, being more than infinite. One of the most exciting projects for The Infinites Music has been scoring the theme song for the 26th season of Power Rangers, Power Rangers Beast Morphers. Landing the project, though, began before The Infinites Music existed. which technically he did, since Cash earned his degree in composition. So, at the end of their 10-minute conversation, Noam gave Cash his info to hit him up about some projects. Not until several years later, when Cash was back in Dallas, did he finally contact Noam about composition work. Turns out, Noam actually lived (and still lives) in Paris, and was looking for singers without a French accent to do vocals for songs to air on TV shows, including Power Rangers Dino Charge. So, Cash sang vocal tracks for Dino Charge, which led to scoring the theme song with Ian for the next season, Power Rangers Ninja Steel, to only be dropped the week before airing for a different theme song, and eventually to score the theme actually used for Power Rangers Beast Morphers. Another awesome project Ian and Cash have continually been working on is producing music for Wendy Child, who was actually the first ever Homie I interviewed and wrote an article for! Ian and Cash almost consider Wendy to be the third Infinite, since they work so frequently and flawlessly together. Not only does Wendy have the vocal technicality of a surgeon singer, according to Ian and Cash, but she also has helped the duo with songwriting on several occasions and has sung vocals for Noam Kaniel as well. Wendy additionally was one of the many reasons that convinced Ian and Cash to both move to Nashville and join H.O.M.E.. All three being at an event for TONS and searching for a collaborative, co-working world, they found H.O.M.E. and became one of the first members. One of the reasons they passionately sought a collaborative working space is because they were part of a similar environment at a house in Dallas where a slew of musicians, producers, and artists were co-working and absolutely loved the vibe of so many creatives creating together. Ian and Cash didn’t see a creative environment with a community-centric music culture anywhere else in Nashville. Being immersed in the positive energy at H.O.M.E. beats working in a solitary home studio, even though working from home is more convenient; however, convenience is a creature comfort that Ian and Cash can live without to be at H.O.M.E.. The duo admits that H.O.M.E. founder Logan is a visionary. People are coming from NY, LA, and Atlanta among other metropolises to be here in Nashville. In those other cities, collaborative communities are more common, and people will be seeking out that same vibe when they come here to Nashville. Since music creatives are coming from all over to be in Nashville, there is now a beautiful mélange of genres in the fruitful Music City, USA. Ian and Cash are excited to see what could happen as a result of the creative music mixture. Last but not least, Ian and Cash from The Infinites Music want to connect with and help out more Homies! Their specialty is working with artists who don’t have a lot of playing background or who don’t a clear vision of their sound. Ian and Cash thrive on taking extra time to help artists do some creative soul searching for their unique sound. The duo also enjoys working with an array of genres; as long as the quality is there, they are passionate about the artist. The Infinites Music has a plethora of projects on the release horizon, so follow their socials to stay up to date! And feel free to give them a big, warm hello!